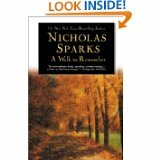 This is a study guide for the book A Walk to Remember written by Nicholas Sparks. A Walk to Remember was made into a movie in 2002, starring Mandy Moore and Shane West. There were many changes made to the story in the book, which always happens when a book is transformed into a movie. Novel and film are different artistic genres and need to be approached in different ways. Please click on the literary analysis category link you wish to be displayed. Back and Next buttons can guide you through all the sections or you can choose to jump from section to section using the links below or the links at the left.